Jhuri Lal has never been to school. He got into the Gardening Profession due to his father who was also in the same line of work. He taught Jhuri Lal all about how to look after and care for plants. 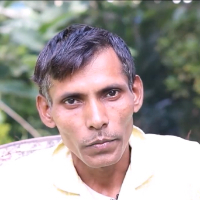 Jhuri Lal has been working in this field for over 10 years. "I have not done any Schooling. I learned this Profession from my Father who was also a Gardener. I have over 10 years of experience in this Profession."